When an estimated 100-200 antiwar activists marched on the National Air and Space museum this weekend, they took the Occupy DC name. 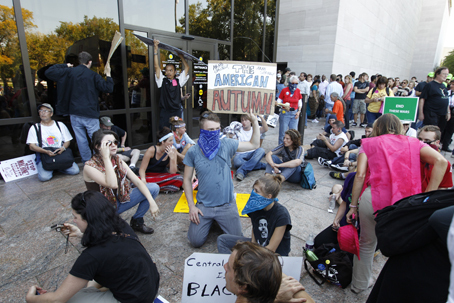 Occupy DC, in turn, was a name claimed by already organized groups of activists who wanted to demonstrate solidarity with Occupy Wall Street. In fact, Stop the Machine, the antiwar group, had planned this demonstration well in advance, and had displayed a tighter focus, on the war in Afghanistan, than most of the Occupy efforts. Some of the demonstrators tried to rush the guards, and to get into the museum to protest an exhibit on unmanned aircraft (drones), like those the armed forces are now using. The ensuing standoff led to guards pepper-spraying somewhere between one and twenty of the demonstrators, and shutting down the museum for the rest of the day. The shutdown was a great opportunity for opponents of the Occupy effort to discredit the campaign, emphasizing its disruptive intent and its aggressiveness. The most aggressive and disruptive of the protesters, by his own account, was Patrick Howley, an assistant editor at the American Spectator, an extremely conservative magazine. Howley explains that he had (easily) infiltrated (read: joined) with the express intent of getting them to confront the police and discredit the larger movement. Howley explains, and recounts his vision of the event on the Spectator’s blog. According to Howley, the siren song of the radical left is strong, particularly when carried by large numbers of attractive young women. Alas, as he tells us, the demonstrators were timid about confrontation, but he was able to demonstrate his protesting virility by getting past the guards and provoking pepper spray. Whether the museum would have been closed without his efforts is an open question, but I’d think that anti-Occupiers would be wary about using this particular example in their rhetorical campaigns. With our without Howley, however (and I’d guess the Spectator will consider continuing without him–isn’t it, after all, a journalistic enterprise? ), one problem he demonstrates is a common one for movements in the United States. Every social movement draws up some people so intensely committed that they will say–or do–something that would offend the great majority of people in that movement. Sometimes those word–or an action–can discredit the movement as a whole. But movements, particularly those with a democratic ethos, have a hard time policing their boundaries. You “join” by showing up at something or doing something, claiming the name or cause. Tea Party activists worked to purge their rallies of racist signs, and I can’t believe that most of those demonstrating outside the Capitol approved of throwing racial epithets at members of Congress, much less spitting at them. The second denial defense is that the offender really wasn’t one of us, but was operating on his own. The antiabortion movement, for example, worked hard to disown Paul Hill, particularly after he shot a doctor who performed abortions. (Hill was convicted of murder, and executed in 2003). But movements are stuck with their crazies–at least politically. Although they want to tuck in or cut off the fringe, this is far easier said than done. And the larger a movement grows, the more likely it is to engage at least some zealous people who, uh, don’t help. This is particularly true for an effort like Occupy, which is so determined to remain open and democratic, and, they would add, nonviolent. Whether the Occupiers will be tarred by the museum protest, legitimately or otherwise, be assured that something else will happen, that their opponents will point to in order to discredit, dismiss, and marginalize the emergent movement. The very difficult response, particularly for a democratic movement, must be taken in advance: it is to put forward, consistently, a clear focus on issues and sharp parameters on acceptable political tactics. This entry was posted in Uncategorized and tagged Air and Space Museum, American spectator, Occupy Wall Street, Patrick Howley, Paul Hill, violence, Washington DC. Bookmark the permalink.